Update: Applications for the 2019 Amplifier are now closed. Thanks to all the worthy organizations that applied. We’re currently reviewing applications and will be announcing the winners soon. 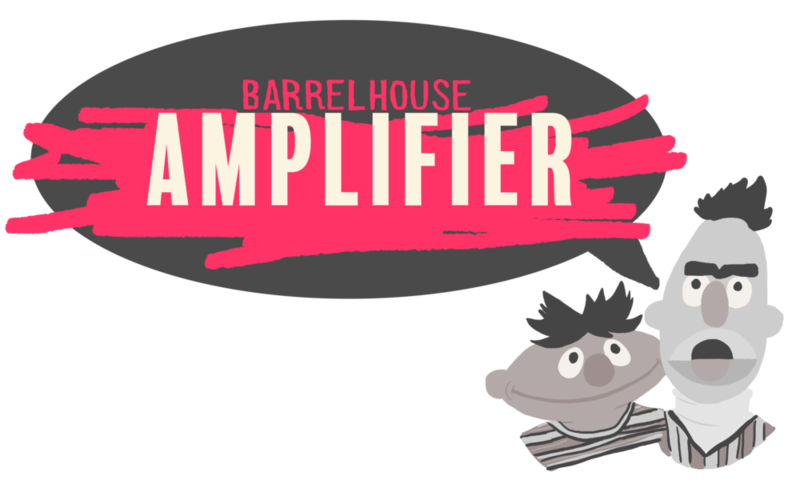 Barrelhouse is proud to announce that we’re once again partnering with Submittable on the Barrelhouse Amplifier, a $1,500 award for emerging literary organizations. Applications for the 2019 Amplifier will open on January 1 and close at the end of the month on January 31. This year we’ll also be awarding a second grant for $500, sponsored by Mythic Picnic. The award is open for all emerging literary organizations. More context about what this means is below. Here’s everything we think you’ll need to figure out if your group is a good candidate for the Amplifier, how to apply, and what to expect. A link to the application is included at the bottom, in the What's Next section. $1,500 from Barrelhouse and our partner Submittable. Also, advice and counseling and mentoring and connection-making in any way we can provide it. Don’t worry: we’re not going to micro-manage every step of your organization’s development. We don’t want to sit in on your meetings. But we want to offer help when you need it, and advice when you want it. We don’t pretend to be the smartest people in any room, but over the past 15 years we’ve learned some things about navigating the literary world (mostly by trial and error) and we’re happy to pass on whatever acquired wisdom we can. If you want it. All emerging literary organizations are eligible. If you're not in the U.S., that's fine. We're in the U.S. and that's the landscape we know best, so you might have to work a little harder to explain to us where you fit and what your audience is, but we're open to international applicants. No university-affiliated magazines or presses. We know you have struggles of your own and they are real, but we’re looking to support an independent organization. Repeat applicants are fine: if you applied previously and you meet these eligibility requirements, by all means feel free to apply again. This is tricky, but: no organizations with which Barrelhouse or its editors have a working business relationship. This does not include organizations that have participated in our conference. It does include presses that have published our (individual) books or organizations with which Barrelhouse has active business relationships. If you’re not sure if you fit in this category, get in touch and we’ll figure it out. We’re going to be careful here, so if you have to ask, probably you’re ineligible. Also, hi! Looking forward to seeing you at AWP! We are looking for existing organizations. If you have an idea but you haven’t actually started up yet, this isn’t the right place to find your funding. We want to support a young, “emerging” magazine or press that could use the support. Our position on submission fees is well documented (spoiler alert: we’re against them). We know that it is hard out there for an independent lit mag/small press, so it’s not a total non-starter if you are charging or have charged submission fees, but we’d probably need to know why you made that choice and how you see the future of that situation if we’re really going to consider giving you money. There are really good answers to this question and we appreciate what some of you are doing out there. We love the fact that there are so many people doing work that might push the definition what “emerging literary organization” might mean, so if you’re not sure whether your group might be a fit, or if you have any other questions about eligibility, get in touch and ask us some questions at yobarrelhouse at gmail dot com. We’ll get back to you as soon as possible. There is a simple application process where we want to know who you are, what you do, why you could use the help, and what you might do with the money. We care much more about your mission and how our assistance can help you turn it into a sustainable positive force than we do about your tax returns. This is going to sound overly simple and it actually turns out to be really complicated: we’ll choose the group we like the best, and that will be based on what you do, how you approach what you do, and the chances the $1,500 could help you turn what you do into a sustainable venture. Just a quick aside that that’s two times in a row we’ve used the word “sustainable.” Hint. Like evaluating submissions for a literary magazine or small press, this a completely subjective process, and a very difficult one, and we’ll all just have to be cool with that. We’ve kept the application short, so you’re not wasting a ton of time filling out paperwork, but we may ask you some follow-up questions, or for more information or materials, as we work toward a decision. Positivity: the world is pretty dark and crazy right now. We would love to support an organization that can help turn the lights back on. Inclusivity: we are committed to supporting organizations that seek to create and maintain spaces for marginalized voices. Community: we want to support organizations that in turn support communities of readers and writers, and foster those communities, whether that’s through readings and events or workshops or just getting necessary writing out into the world and into the hands of people who need it. Sustainability: we will definitely give priority to organizations who would use this one-time support to make or enhance something that organically supports itself over time. Serving writers: this is what we like to do. Serving readers: this is what writers like to do. A few laughs every now and then: we are still Barrelhouse, after all. We believe we can help make things better without taking ourselves super duper seriously. If this sounds like a thing you want to apply for, roll on over to the application on Submittable. If you have questions about this, feel free to email yobarrelhouse at gmail dot com. The application will be open from now through January 31, 2019. We’ll announce a decision at the AWP meeting in March. ﻿Our first Amplifier winner was Girls Write Pittsburgh, which serves self identified teen girls in the Pittsburgh region through the craft of creative writing. ﻿In 2018 the Amplifier was awarded to Fiyah, a a quarterly, digital publication of fantasy, science fiction, and horror by Black writers. These are difficult times. Here at Barrelhouse, the things that have always helped us get through dark periods in the past are literature and the literary community. What is writing and reading if not a call and response: Am I alone? No, you're not alone. I hear you. I feel these things, too. As writers and editors, we hope some of what we do is important. That in its own small, literary way, it reaches people, affirms them, and reassures them that they are not alone. We remember very well the times -- the years -- after we launched when we were unsure whether or not we could financially sustain ourselves long enough to do everything we wanted to do or even to put out another issue. We’re mostly through those times and we want to help other organizations get through them as well, and that’s why we launched this award to provide what emerging organizations need most -- actual cash money, in the form of $1,500 -- in addition to advice, support, mentoring, and any other non-financial resources we can provide.